Are you looking for gifts for a crochet-lover, but don’t know where to start? 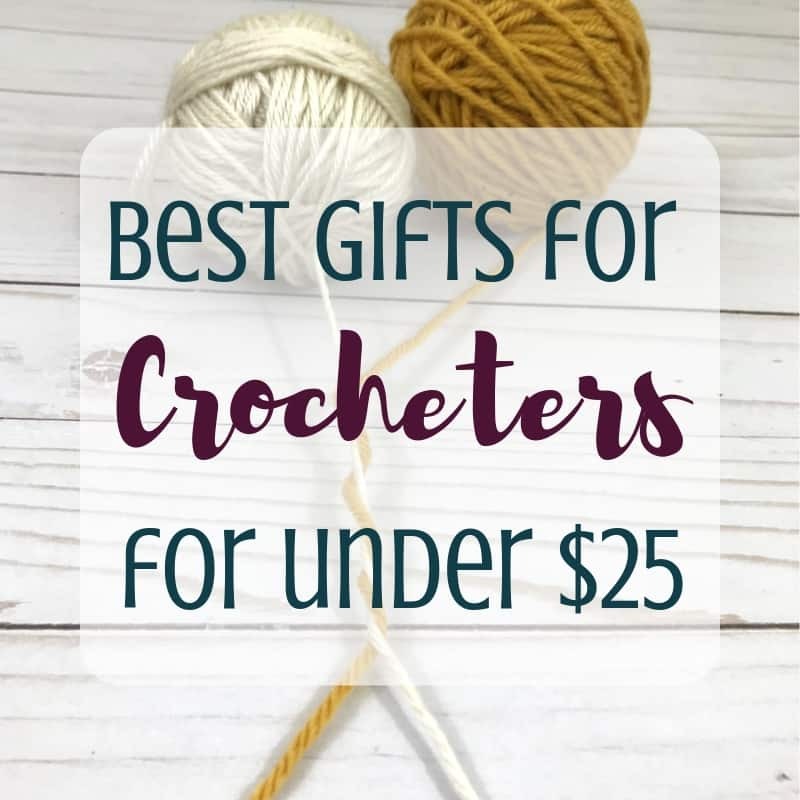 This list of the Best Gifts for Crocheters for under $25 is just what you need to find the perfect gift for the crocheter in your life. But….I see you lurking here, Crocheter…. You know this page is intended for someone who is looking to buy gifts for their crochet-obsessed loved one, but here you are…..
You are curious what you are missing out on. Have no fear. I get it. I really do and honestly, this page is more for you than for them. What business do I have telling non-crocheters that a yarn winder is going to make you squeal with delight? So get comfortable and start making that wish list, or just go ahead and add these crochet goodies right to your cart. I won’t judge. In fact, I’ll be super excited for you. You love crocheting and fun amazing products that enhance the crochet experience are worth spending a bit of money. These are all items I have tried personally: I own them, use them, and am excited to share them! You can purchase the hooks individually which I recommend if you want to just try one OR you are looking for some of the larger hook sizes. If you have the time to spare and want to save a buck or two this is where you’ll want to price shop. Many of the larger hooks are amazingly cheap on Amazon, but many of the other individual Clover Amour hooks will be cheaper if you buy them one at a time from Joann’s using a 50% or 60% off coupon. The 10 piece set is over our $25 price point, but overall it is the best deal around for a set of amour hooks in standard sizes. If you do a simple search on Amazon for ergonomic crochet hooks, you will probably be a bit overwhelmed with all of the options. But one of those options is marked a best seller, so that’s a good place to start! This 9 piece hook set ranges from size B (2.0mm) to size J (6.0 mm) and comes with an adorable bag, a 9 piece needle set (keep reading for another needle recommendation) and stitch markers. This set is perfect for two different scenarios: You are still using good old metal hooks and don’t know if ergonomic hooks are worth the extra cost, or you’d like to have back up sets for your nice hooks.These won’t cost much extra (I purchased them for less than $10) and you will be wondering why you hadn’t tried comfy hooks sooner. They aren’t as smooth as the pricier hooks, but they still work well and are more comfortable than the metal hooks. Headlamps are great, until you are the passenger in a dark car and you accidentally blind the driver as you glance over to answer a question. (I am not speaking from experience.) Why not have hooks that actually light up? If you crochet on road trips or in dim lighting or just want some extra help seeing your stitches (think black yarn situations) these light up hooks are perfect! These hooks are surprisingly smooth and comfortable to work with on top of just being awesome because they light up. My only reservation is that they come with small button batteries which are easy to access. If you have kiddos, you’ll want to make sure these hooks stay out of reach. There are many great hook case options out there. This hook case comes with a wipeable, spill proof cover, adorable pattern options and two full zippered compartments to store your hooks and more. One side has slots for tiny hooks and regular hooks and the other side slots for larger hooks or even pens. There are also two small zipper pouches which are large enough to hold your other accessories without being too deep that it is hard to dig out a stitch marker or needle. Who doesn’t want a crocheting tool that can also be worn as a necklace? This yarn cutter pendant is super handy especially if you have little kids and having scissors out isn’t realistic. It cuts through yarn well although you do have to keep some tension on the yarn for it to cut. How much do you loath trying to fit bulky yarn through the eye of a needle? Even if it is a large eye tapestry needle, getting that bulky yarn through there is no walk in the park. These wool needles are the perfect solution.The eye is flexible so even thick yarn can fit and it collapses around the yarn as you pull it through your project to weave in your ends. The shaft is metal so it doesn’t bend as you are weaving and it glides through the stitches. Have you noticed on Instagram that it seems like everyone has these adorable dainty little scissors? They aren’t just cute but are totally functional. This set is great because you get two different sizes and both sizes are small enough to easily carry in your hook case. If you flip through the options in this listing, you’ll see many different combinations of scissor sizes and styles, including a set with three different sizes and scissors with adorable floral prints. Yes, you can make your own pom poms but just because you can, doesn’t mean you have to make all the things! These pom poms are full and fluffy with a little loop at the bottom to attach it to the hat which is perfect for removing it for washing. There are also pom poms that have an easy button attachment but I have not tried them yet. Having a fluffy faux fur pom pom really takes your hats up to the next level. Why oh why did I live without a yarn winder for such a long time? Even if you don’t buy yarn that is in hanks, winding leftover skeins saves so much room and helps keep your yarn tangle free until you are ready to use it again. The satisfaction of seeing your yarn turn into adorable little cakes is worth the cost alone! If you buy lots of larger skeins of yarn (over 4 oz) which you want to wind, you’ll probably want to look for a winder that has a larger capacity. The one thing every yarn lover needs, besides more yarn or maybe I should say because of MORE YARN, is storage for all that fibery goodness. These storage cube organizers aren’t fancy but they do the job and hold so much yarn as well as other supplies. My storage cubes have lasted through a move and through being moved all over our house and repurposed several times. They’ve been used with and without bins and currently hold fabric and yarn! The only thing they haven’t withstood so far is an unnamed child trying to stand on the lowest cube. You can find pretty much any stitch you’d like online not to mention there are SO MANY PATTERNS, (obviously I have both stitches and patterns right here on Stitching Together) but sometimes it is so nice to just flip through a beautiful book of stitches to get inspiration. Crochet, the Complete Guide is a lovely little book with great pictures, graphs and stitch instructions. The stitches range from basic stitches, to shaped motifs, Tunisian stitches and more. The size of the book isn’t overwhelming and it is perfect to stick in a bag to take with you! Basic Crochet Stitches is another great book to flip through to get ideas and inspiration. There are many unique stitches which aren’t seen elsewhere and the photos and instructions are well done. Plus it is pretty enough to have sitting on your living room coffee table. You are sure to find inspiration in these pages. Crochet classes aren’t tangible gifts like the rest of the list, but the gift of learning is always welcome! There are numerous free online resources for growing in your crochet skills, but sometimes you need just a little more guidance as you learn a new skill or improve your technique. Online courses are tailored to bring you from start to finish in the learning process from the comfort of your own home. Craftsy is a great place to look for courses and they are on sale regularly! If you’d like more than one class from Craftsy, they have a subscription site, Bluprint, for around $10 a month. Last but not least, don’t forget gift cards! The one thing that every crocheter always needs wants needs more of is yarn! A gift card to a craft store or local yarn shop will be much appreciated. Can you think of any items that should be added to this list? I love trying new crochet tools so any recommendations are always welcome and you can leave them in the comments. If you try any of these items or receive them as gifts, I’d love to hear about that too! 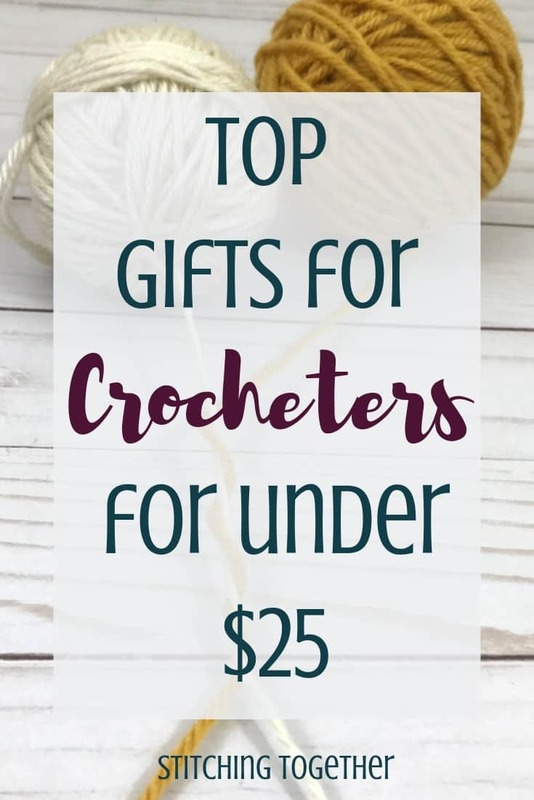 Be sure to share this post with your crocheting friends and with anyone looking to buy you a gift!